Boingo Wi-Finder is a free software application for Windows 8 that can locate Boingo wireless hotspots. 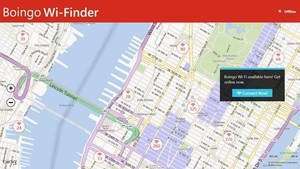 Boingo Wi-Finder can automatically log you in to your Boingo account, simplifies the connection procedure and give you directions to the closest hotspot. Version 1.0.0.52 is a freeware program which does not have restrictions and it's free so it doesn't cost anything. For security reasons, you should also check out the Boingo Wi-Finder download at LO4D.com which includes virus and malware tests. Additional screenshots of this application download may be available, too.